Sam Huckaba is a quiet visionary with a talent for solving problems — a down-to-earth guy with a doctorate in mathematics who revels in tackling an equation, considering the variables and finding the right solution. 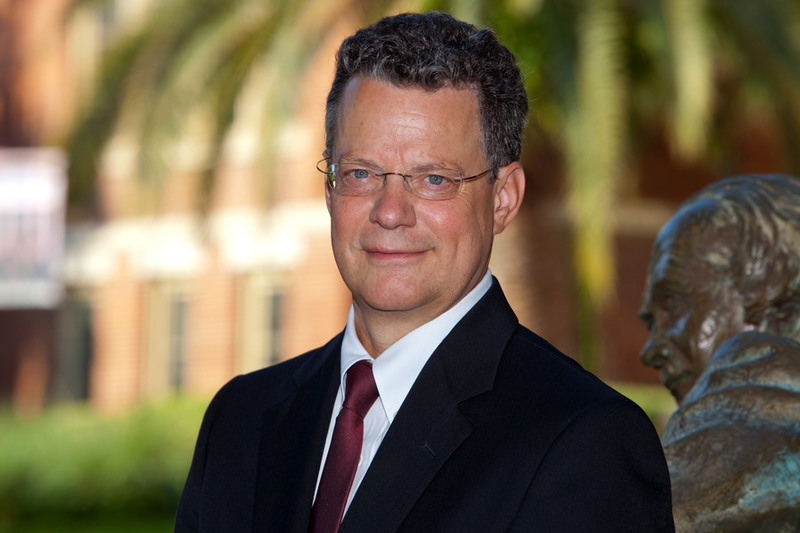 As dean of the College of Arts and Sciences, Huckaba leads the largest college at Florida State University with 11,000 student majors and 600 tenure-track and specialized faculty members. He’s always looking over the horizon and seeking the next innovation to meet the needs of an eclectic student population with wide-ranging backgrounds, interests and goals. Huckaba calls Arts and Sciences the academic core of FSU. The college comprises more than 30 departments and other programs. Each year, it delivers about half of the total student credit hours for the university because its courses are part of general education requirements. That means it has made a significant contribution to Florida State’s huge leap in U.S. News & World Report’s rankings — up 10 spots in the past two years. Huckaba has led the college toward higher success over the past seven years in the dean’s role. His management philosophy focuses on leading by listening. He describes the college as a decentralized “grassroots system,” where ideas start at the faculty level and build toward his office. All the while, he’s watching and listening as plans percolate. Paying close attention to all the moving parts in the sprawling organization is a top priority, Huckaba said, so he does his homework. He takes time to learn about all the units so he can advocate effectively for each one. It’s a good role for this award-winning math professor, whose academic training and interests include such subjects as algebraic geometry and coding theory, because he has an affinity for gathering data and analyzing trends for some 70 majors in the college. The challenge of guiding such an extensive collection of fields, ranging broadly across the humanities and sciences, energizes Huckaba and feeds his own intellectual curiosity. His elevator speech for Arts and Sciences moves effortlessly through the departments, institutes, centers and programs, and he uses those insights to elevate students and faculty. Huckaba wants these experts to have the latitude and power to do their work in creative ways, so he tries to craft a conducive environment for teaching, learning and research. That means developing the right infrastructure to support those efforts. 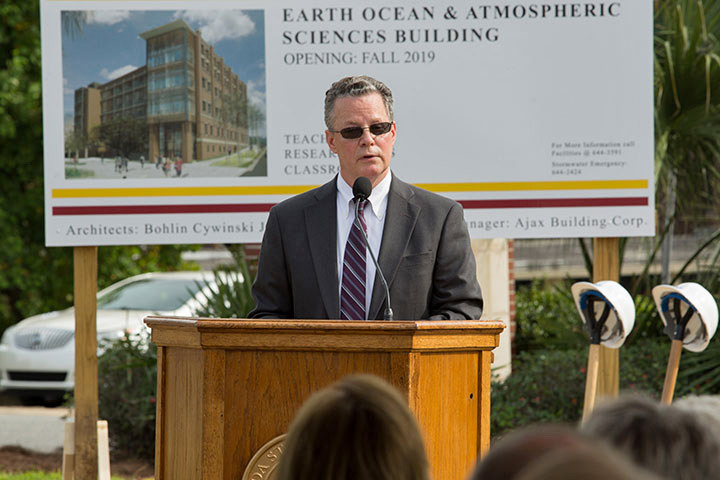 One example is the 130,000-square-foot building for the Department of Earth, Ocean and Atmospheric Science now under construction. The seven-story facility, scheduled to open in summer 2019, will bring together multiple disciplines in a collaborative space. Creating that kind of supportive environment demands a deft skillset: the ability to make successful pitches to those who control funding and have the aptitude, and interest, to manage money efficiently. Of course, that’s his wheelhouse. Huckaba has excelled at that process, too. New funding has allowed him to take actions that reduce student-to-faculty ratios in key areas, such as writing, where students can learn better in smaller classroom environments. Calculus classes will be smaller this fall, too. Huckaba also is excited about the launch of a new undergraduate degree in neuroscience this fall, previously available only to graduate students. The degree will offer a new pre-med path for students. Neuroscience will be one of an increasing number of programs offering undergraduate students hands-on educational experiences in Arts and Sciences, and Huckaba believes those experiential learning options are crucial for the future. The College of Arts and Sciences, founded in 1905, has always focused on cultivating well-rounded graduates who earn comprehensive degrees that equip them for a variety of jobs. While that remains the fundamental structure of the college, Huckaba has supported the development of more programs offering professional degrees. FSU-Teach is one such program. It trains students to become science and math teachers, and graduates are positioned to land high-demand jobs as STEM educators. FSU-Teach is an innovative partnership between Arts and Sciences and the College of Education that awards a degree with a double major. Other professional degrees that have thrived during Huckaba’s tenure include master’s programs in statistics, financial mathematics, computer science and public history. Undergraduate students can pursue direct professional paths in actuarial science, Middle Eastern studies, as well as editing, writing and media, which has earned notable success in the English department. That major is designed to train students with skills well suited for today’s rapidly shifting media landscape. In addition, Huckaba has pushed for a new postdoctoral program that has brought more scholars to the college. It’s worked. Humanities units have started hiring postdoctoral scholars, who help meet teaching demands and also receive professional training. In science units, a new cost-sharing system enhances funding from external grants to attract recent Ph.D. recipients for research and teaching work. Today, postdocs work in every department. As he looks to the future, Huckaba sees the people of Arts and Sciences helping to lift the whole university. He enjoys listening and acting on ideas that take the college to the next level.